It’s been just days since we were in balmy Arizona and busy Southern California. 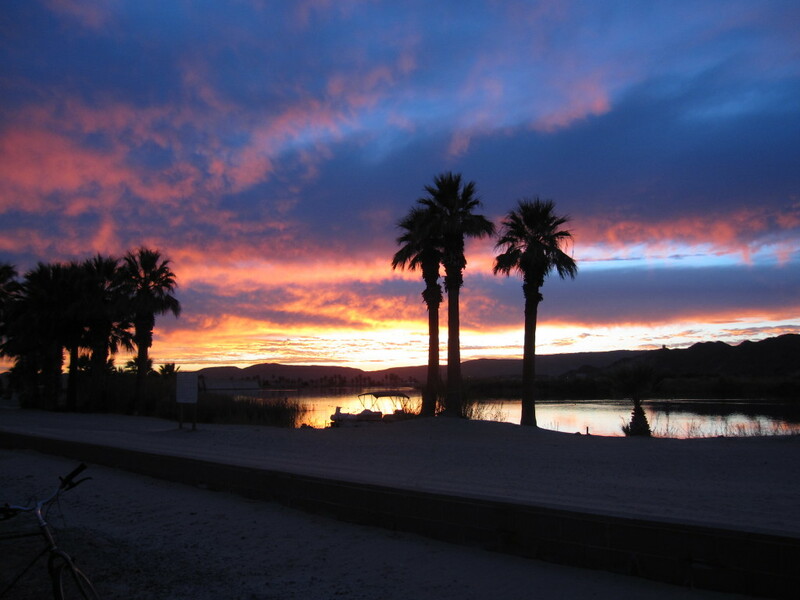 I could share beautiful, sunset pictures taken over the Colorado River from my lawn chair. Or I could share some of the oddities that we saw, heard, and witnessed. A guy visibly packing a Glock on his way into Yuma’s Best Buy. Apparently he got a really good deal on 20 TVs. Two mimes driving a new Mercedes sedan on a SoCal freeway. A kazillion cacti, the F-U of vegetation. Santa riding a horse on the beach. Santa is from Calgary (it’s cold here). And I know his brother-in-law. The Organ Pipe Cactus National Monument. Who knew? A Titan II missile that is very phallic. As are the organ pipe cacti, come to think of it. What bizarre things have you experienced over the past few weeks? Glad you had a good trip. We were neighbors for a moment there. That’s right. I almost forgot I was next door to Mr. New Mexico. What bizarre things have I experienced over the past few weeks? I had the flu. You really want the bizarre details? Did you know that the human body can make liquid flow from… no wait. never mind. Oy. So not fun. Hope everyone is on the mend and all liquids are ones of choice. Living in Asia now, I experience the odd on an almost hourly basis. Like, it is commonplace to get your to-go food in a plastic bag. Egg roll….plastic bag, soup… plastic bag, chicken feet…plastic bag, rice…plastic bag, bubble tea….cup inside a plastic bag. No one even thinks twice about eating straight from the plastic bag either. Don’t have time to finish? Tie that bag up and stuff it in your pocket/ purse for later. Your comment takes me back to living in Thailand. I miss Asia (sometimes…). Pretty much everything in South Florida is bizarre. Sounds like a fun-filled vacation! Next time, stop by my place in Colorado!! A visit would be such fun! Love the Walmart comment. This probably isn’t the right way to contact you and I was going to attach this as a comment to a related blog but couldn’t find one. Anyway, thought you would appreciate my thing I never thought I would say to my kids ” All superheroes out of the kitchen.” I have also been known to regularly say “No balls in the kitchen”. Apparently I prefer my kitchen feminine and average. Thanks for taking the time to comment, Elizabeth. I think you could write a book entitled Bizarre Things I’ve Said in the Kitchen. Love the balls one. Hilarious! Never fails any time there is a beach or pool in Mexico, “old caucasion guy wearing shorts with black socks hiked up to his knees”. And saw a muscle head checking his “junk” in the pool! My girls age 11 & 8 hid an iPhone behind the Christmas tree and recorded “Santa” on Christmas Eve. Busted. I know the ‘track’ in front of my house where we shovel the snow from the city walk is getting more and more narrow – but what’s with these people who spend the nice chinook days shoveling snow off the road. Go for a coffee, buddy. I know. My neighbour shovelled our driveway 4x when we were gone. AND he cleared all the snow from the road in front of our driveway. I think we should go away every time it snows. Eek, I think I prefer the penguin-crossing signs in NZ! Most bizarre thing I’ve seen was me trying to do things with my right hand while restricting my left arm following shoulder surgery. Glad I can finally use my left again. Glad you’re on the mend, David! The most bizarre thing that’s happened to me recently is realizing I missed a golden opportunity to become a mime! Apparently it’s quite lucrative! Brilliant comment. You, dear Jules, are funn-eh. Who sees a tanks-crossing sign, not something I have ever seen……….. This was a lot of fun but also bizarre but you have to know our family. Over the holidays we rented a soccer field court in Indianapolis, and ages 14 to 72 played hard for an hour. We had no subs so tiring for the old folks. We all survived with no heart attacks or immediate injuries but most could not move the next day. The most bizarre thing to happen to me this week was an unintentionally hilarious comment my 7 year old daughter made while I was chopping garlic. – It’s garlic. (I rip it open). These are its cloves. – You’re ripping its cloves off?! Not quite as cool as cacti and tank crossing signs, but I’ve never laughed so hard at any comment my kids have made. So yeah…bizarre for me. Cool site! I’m going to need you to steal that Tank Crossing sign for me. I. Need. It. Or at least a bumper sticker. And I’ll send my MANY profits to your mother. I have a picture of myself standing next to an Emergency Snow Route sign…in Abaco Bahamas. It’s an actual street sign with an official city logo on the back and mounted in concrete to the street. Although it seemed to be primarily used as a urinal for the local dogs.